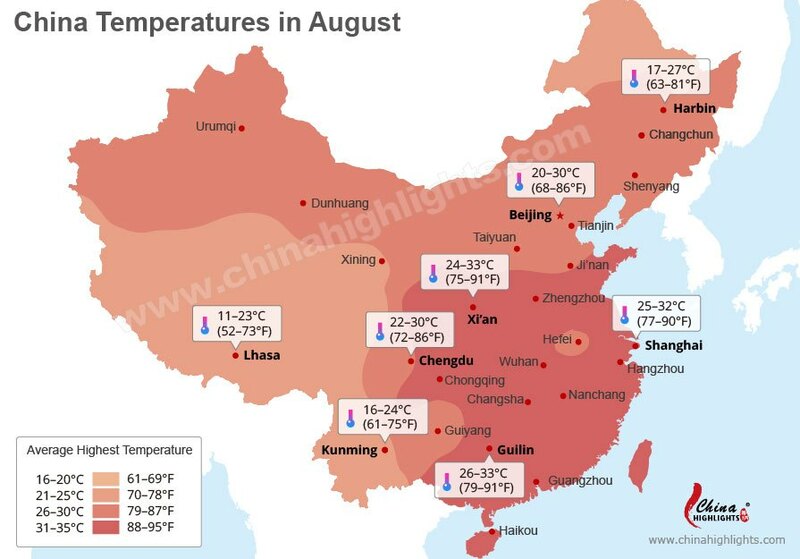 August is hot and humid throughout most of China. It is also one of the wettest months. July and August are Beijing&apos;s rainiest months with some fairly heavy downpours. Central and South China are also hot and rainy. Cities south of the Yangtze River, such as Nanjing, Shanghai, Changsha, Wuhan, and Hangzhou, see the highest temperatures. Sometimes it rises to 40°C (104°F) or more in these cities, which is why the Chinese call them "furnace cities". August is also one of the busiest months for tourism in China. China&apos;s top attractions are crowded with many Chinese tour groups and families. Tourism: It&apos;s the summer holiday and China will be in its peak travel season. Prices go up and tickets and hotels sell out quickly. Top attractions will be very crowded. The warm weather and sunshine is great for outdoor activities, traveling, and shopping in the street markets. It is so warm that you can travel light. August is the peak season in China. This means the top attractions, such as the Terracotta Army, are packed with tourists. Schools and universities are on vacation; therefore, expect a great number of students, school tour groups, families, and big noisy Chinese tour groups. August is a rainy month for most parts of China. There might be heavy rain, thunderstorms, and flooding in Central and South China. The coastal areas sometimes suffer from typhoons. Read more about the Top Places to Visit in China in August. The first half of the month is hotter than the second half. In the inner cities, it can sometimes reach over 38°C (100°F), but it is usually comfortable at night. Beijing is hot and rainy in August. The average temperature is 20–30°C (68–86°F) and there are typically 13 days (183 mm, 7 in) of rain in August. There is light pollution. Xi&apos;an is actually a little hotter than Beijing. In the first three weeks of the month, there might be "furnace city" temperatures reaching 40°C (104°F). You can visit the cool museums on sweltering days. Beijing and Xi&apos;an will be crowded in August and top attractions, such as the Forbidden City and the Terracotta Army, will be flooded with seas of people. If you are planning to visit these two cities in August, arrange your tour schedule flexibly to avoid the big tour groups. 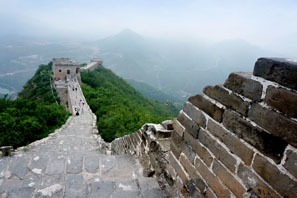 Beijing: The Great Wall is a must-visit attraction and the famous sections, especially Badaling, are not recommended in August as there are a lot of tourists. 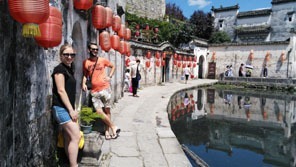 You may consider visiting other less crowded sections, which also have great scenery, such as the Mutianyu and Jinshanling sections of the Great Wall. East China gets its heaviest rainfall in late summer in August. The rainfall is associated with typhoons and storms. It is also often sweltering. The temperature is usually over 30°C (86°F) in the daytime. Take Shanghai as an example — the average temperature range is 25–32°C (77–90°F) and there are typically 14 days (132 mm, 5 in) of rain in August. 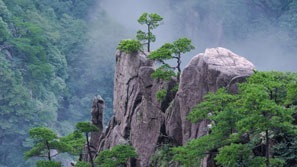 Huangshan: Mountainous areas are ideal places to avoid the summer heat. On hot days, you can leisurely hike among the Yellow Mountains where it is cooler, and enjoy the summer sun on Hong Village. Take a light waterproof as it rains more in the mountains — great “cloud sea” weather. Shanghai: Besides skyscrapers, Shanghai is also famous for the water towns and traditional Chinese gardens nearby. 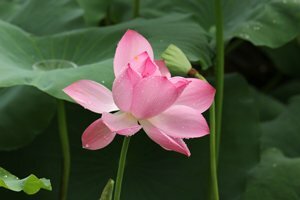 Water towns and gardens are an excellent choice for August. The area around the Yangtze River has its hottest days in July and August, and the rainfall is heavy. The high humidity makes Wuhan and Changsha feel like some of the hottest "furnace cities". 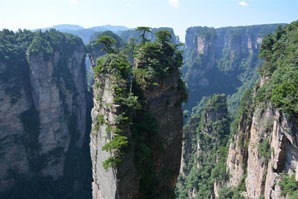 The mountains in Zhangjiajie feel cooler and are good places to go in hot weather. The average temperature is 25–33°C (77–91°F) and there are typically 8 days (120 mm, 5 in) of moderate rainfall in August. 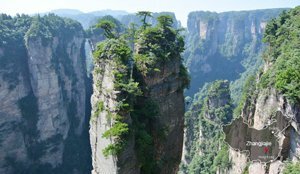 Zhangjiajie: Zhangjiajie National Forest Park and Tianmen Mountain are two great places to visit in August to benefit from the cooler temperature. The mountainous areas are usually cooler than the cities as they have a higher altitude and more greenery. 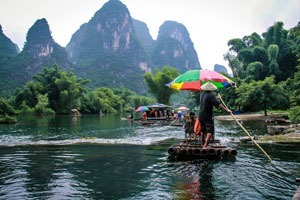 Guilin&apos;s rainfall decreases in August and it&apos;s a great month for outdoor activities. The temperature is usually at its highest in August. The average temperature is 26–33°C (79–91°F) and there are, on average, 15 days (147 mm, 6 in) of rain in August. You can spend your time cruising on the rivers to be cool. Just take an umbrella with you. Hong Kong is hot and torrentially rainy. There are many downpours or tropical storms. 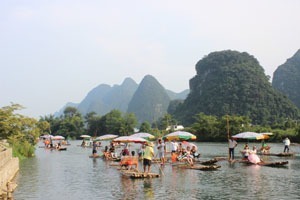 Guilin: A Li River cruise in August is a good idea to appreciate the beautiful karst hills and enjoy a leisurely time. Alternatively, you can go bamboo rafting to get closer to the water and enjoy your time in the sun. The mountains and valleys of Yunnan and Sichuan provinces have pleasant weather — it is cool or warm depending on the altitude. Dali and Lijiang experience heavy rainfall. With a high altitude, Tibet has a cooler temperature than lower areas. 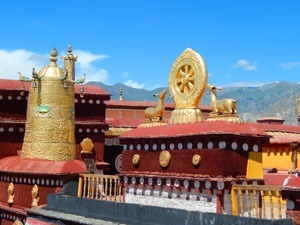 In Lhasa the average temperature range is 11–23°C (52–73°F) and there are typically 8 days (130 mm, 5 in) of moderate rainfall in August. Clothing: During the day, wearing shorts or light trousers, T-shirts or shirts is fine, but also take some rain gear. Take a coat with you if you go up any mountains as the weather is very changeable in those regions. For Lhasa, dress in layers and take a hat and sunglasses. 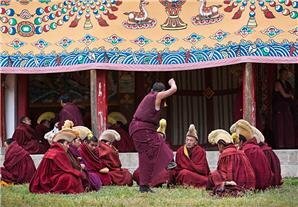 Tibet: There are festivals in Tibet that let you experience more of the Tibetan culture, such as the Shoton Festival, which is usually celebrated in August. With a higher altitude, Tibet has a cooler temperature than other areas in China, and that makes it a great destination to visit in August. The Silk Road: It is a good month for taking a Silk Road tour. Xinjiang has hot and sunny weather with little rainfall. There is a bountiful harvest of top quality grapes, melons, and other fruits. The low humidity makes it feel cooler in Urumqi. Planning a China trip? Our travel advisors are happy to give you suggestions and guidance when planning your trip. If you are interested in touring China in August, contact us for help. Let us help you plan a personalized August tour.